The opening scene of The Hurt Locker is a creepy version of Wall-E. A robot whisks out through dusty silence scanning back and force looking for something. Iraqis hang out of windows looking on. Children stand along the streets. Snipers hide on rooftops. Suddenly it finds what it is looking for and the men of Bravo Company know that there’s some sort of bomb out there that that needs to be disarmed and fast. It’s time to suit up and get out there. The Army’s Explosive Ordnance Disposal [EOD] squad has 38 days left of their tour to search for roadside bombs on the streets of Baghdad. Staff Sergeant William James [Jeremy Renner– Dahmer, The Assassination of Jesse James] has recently taken over leadership of the team. He’s a renegade with a blatant and happy disregard for military protocol and basic safety measures. Sergeant J.T. Sanborn [Anthony Mackie– Half Nelson, We are Marshall] plays by the rules while Specialist Owen Eldridge [Brian Geraghty– We are Marshall, Jarhead] is the newbie on this counter force team. It’s a high pressure job that allows for no mistakes and requires extreme calmness. Improvised Explosive Devices [IEDs] account for more than half of American hostile deaths. 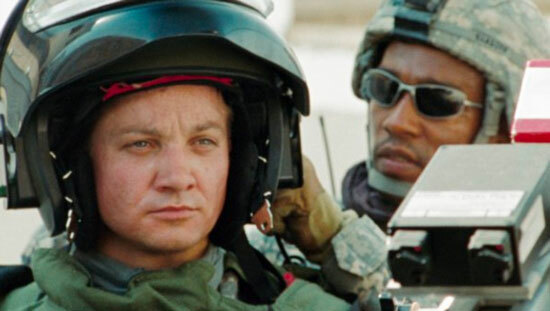 The Hurt Locker is a gritty, frenetic film packed to the brim with terror-filled moments. Told he should put on a heavy Kevlar suit to disarm one bomb, Sgt. James [Renner] says: “If I’m gonna die, I’m gonna die comfortable.’’ He proceeds to disarm the bomb without the protective gear to the amazement of his crew who think he’s a cowboy. Is he fearless or gutsy, rowdy or reckless? Or is this all he knows and how he is most comfortable? The blood pours off in puddles after a particularly tense mission when he showers in full uniform. At home [where he is clearly dissatisfied], James keeps a box of remnants from disarmed bombs under his bed (his own Hurt Locker) while a bomb itself is obviously a Hurt Locker and the war could be a Hurt Locker. There’s no politics involved. It is all about this company and its job: to locate and disable bombs. Renner is a revelation in this break out role. His eyes are the windows into the risks and rewards of his job. The Hurt Locker is written by Mark Boal [In the Valley of Elah] who spent months embedded with troops in Iraq. There is so much death and destruction, blood and devastation, that you cannot help but think about the reasons behind the violence. The Hurt Locker takes place in 2004 during the Gulf War but the emotions that one feels while watching the film transcend the setting and the war. Director Kathryn Bigelow [Point Break, Strange Days] has made her career directing male-centric, action films. 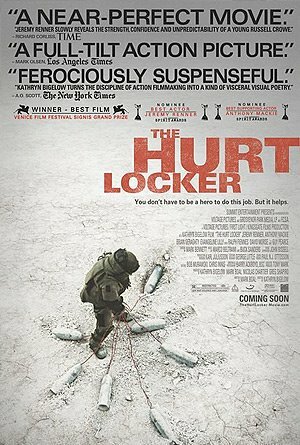 The Hurt Locker succeeds with Bigelow adding elements of grace, empathy and serenity to the demeanor of each character. Within the chaos and danger of The Hurt Locker lies bravery and reasoning. The Hurt Locker is without a doubt one of the most potent films you will see this year. This entry was posted on July 10, 2009, 19:07 and is filed under Film. You can follow any responses to this entry through RSS 2.0. Both comments and pings are currently closed.